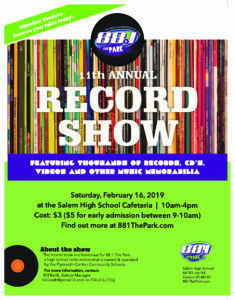 Thousands of vinyl records, CD’s, import only releases, t-shirts, posters, and other collectibles will be on display when 88.1 The Park presents its 11th annual 88.1 Record Show on Saturday February 16, 2019. 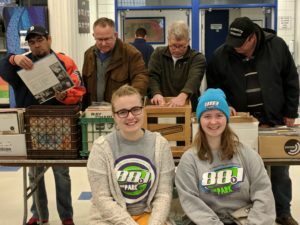 The show will run from 10am to 4pm at the Salem High School Cafeteria, and proceeds will benefit the nationally-recognized student radio station operated by the Plymouth-Canton Community Schools. The show will feature special giveaways and door prizes in addition to a wide variety of vendors displaying their wares. 88.1 the Park expect to build on the success of last year’s show, which was the station’s largest with over 420 people attending. Much of the success of the show can be tied to the resurgence of interest in vinyl records. “Some people would like you to think that music is all digital now, but the record show proves that all wrong. It’s amazing to see so many music fans, from all generations, together in one place,”said Fiona Hughes, Program Director for 88.1 the Park. Admission to the 881 the Park record show during normal show hours is $3. Collectors looking get an early start to their shopping can gain early admission between 9:00 and 10:00 a.m. for $5. Students at Canton, Plymouth and Salem High Schools will receive free admission with a student ID. All of the proceeds will benefit 88.1 The Park, and will help the station to continue serving the community with unique programming and broadcast training for students. The record show is one of the station’s main fundraisers each year. Interested dealers can contact 88.1 The Park’s Station Manager, Bill Keith, at 734-416-7732 or by email at [email protected] Eight foot tables can be reserved for $30 each. Salem High School is located at 46181 Joy Road in Canton Michigan (corner of Joy and Canton Center). The Salem High School Cafeteria is located on the first floor, just inside the main entrance to the school.